This paleo-friendly, gluten-free & vegan pasta is a diabolical way to sneak zucchini and other soft squashes past the squash texture-averse. By cutting the squash in ribbons, the squishy texture disappears and they become more palatable (even for Southerners who grew up hating the gloppiness and squeek of squash casserole). The ribbons also look like pasta; more important than looks alone, your belly is also tricked into thinking it has just consumed a mound of pasta. Yum all around. The creamy sauce helps with this as well and doesn’t taste like coconut – with the nut butter, peppers and other spices, it ends up tasting savory and rich. I loved this pasta; my squash-averse DH ate it warily, but didn’t have any real complaint about it other than he knew it was squash. I’m sure the presence of a big ol’ slab of London broil on the side did wonders for the pasta’s begrudging acceptance. First, prep your noodles. I used a wide speed peeler to make long, wide noodles. If you can use a mandoline without slicing off a digit, the julienne setting makes nice matchstick noodles. I prefer less blood in my dinner, so I went the slow route. It didn’t take that long. If you’re not into wide noodles, stack those babies up and slice lengthwise. Make your creamy sauce. Add the coconut milk, almond butter, spices, garlic, aminos, red pepper and mustard to the bowl of a food processor. Whiz until thoroughly combined. Taste. Add salt and pepper (and any additional amounts of spice) until you’re satisfied. In your largest skillet over medium – medium-high heat, add the squash noodles. A dry pan is fine here; you’re going to be adding the sauce momentarily. Toss the noodles a time or two so each is kissed by heat. Add the spinach and sauce and toss (carefully with tongs or you’ll break all your noodles up and throw the spinach around the room) frequently until it all looks cooked. 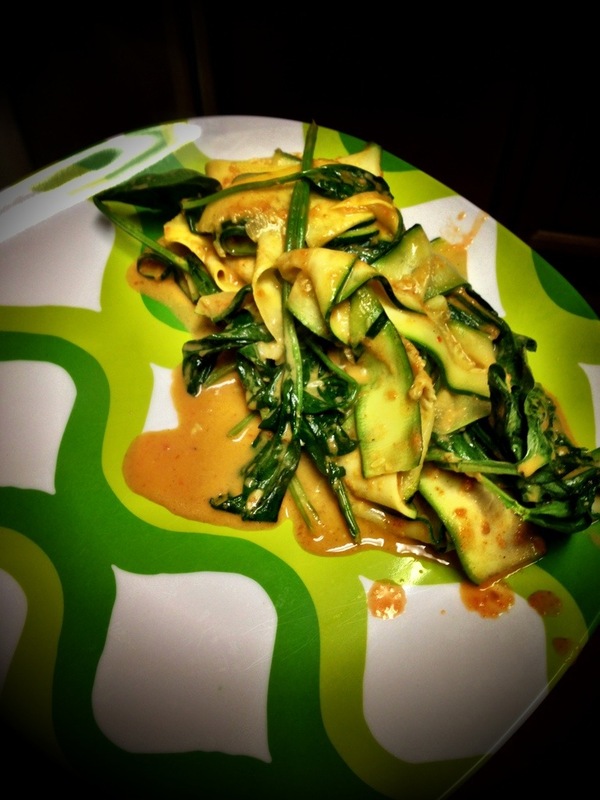 You’re not cooking the noodles to death and you’re not serving them raw – think al dente with wilted spinach. This process should take 5-8 minutes, depending upon how hot and crowded your pan is.